Build a career focal point! Keep your online profile up to date! Turn your career into a robust presence! 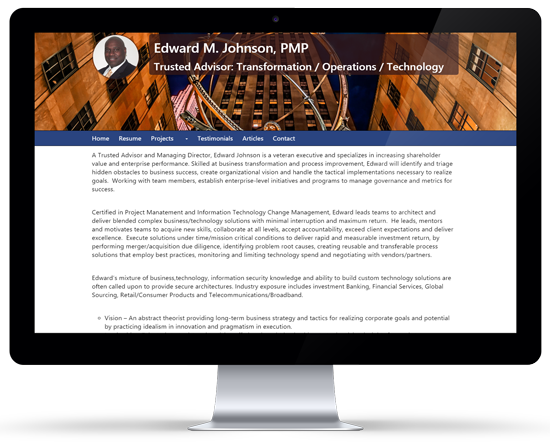 GigBlast™ provides you with a complete career website where you can create a more complete and robust view of who you are, what you bring to the table and how your skills can be leveraged by perspective employers! Other sites only provide just enough space to create a flat, single page view of your career. Consolidate your online presence. Market your career by creating a focal point! Market your experience. Showcase your skills and let employers know how they can leverage your expertise. Control and manage your career. Dedicate time to update your skills and your website! Get all of these features (and more coming) for only $24.95/yr. A small investment for a large impact on your career!